A quick and easy truffle, calling for heart-healthy avocado instead of dairy! Combine the chocolate, vanilla extract and pinch of salt over a double boiler, and melt until completely smooth. (I just use an oven safe bowl over my small saucepan for this.) Mash the avocado with a fork until no lumps are visible, then stir it into the melted chocolate mixture until smooth and thickened. Place in the fridge to set for 20 minutes, or until slightly firm to the touch. 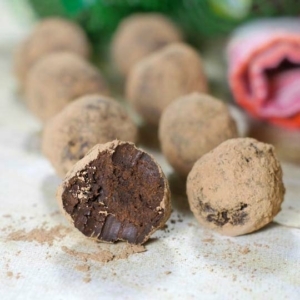 Place the 2 tablespoons of cocoa powder in small bowl, and roll each truffle into the cocoa to coat. Serve at room temperature, but store in the fridge for a lasting shelf life.